Senix: LEVEL receivers gather and process data from one or many Senix LoRa level transmitters, without recurring fees, then display it on a LAN and/or send it to IoT or other industrial applications. Maximum range can be obtained by adding an outdoor or elevated antenna to the Flex receiver. An outdoor IP67 rated receiver (not shown) is also available. LoRa wireless is a low cost, low power, secure link designed for sensors and IoT applications that need to send small amounts of data a few times per hour from varying environments. Dedicated Local Receivers Installed in your plant or office, receivers collect transmitted data, send email alarms, and/or provide LAN or cloud-based displays that are viewable on any device. 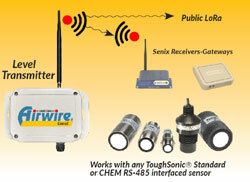 See the AirWire LoRa Receiver- Gateways data sheet. In many locations commercial carriers now offer subscription- based public LoRa "Network- as-a-Service" (NaaS) supporting the evolving "Internet of Things". Senix can help you get connected to these services.